The fastest, easiest, cheapest way to sell your products and tickets online. Get started for free. The first online store you create is on us for 30 days. Anyone can sell anything! Well, mostly anything. Nothing illegal, harmful or offensive, obviously - be reasonable. It starts out free (for one month) and then it stays cheap. You almost don't have to spend money to make money. Almost. It's so easy we've opened shops with our eyes closed, just for fun. Seriously though, if you can type and click, you're good to go. You can sell tickets: No one likes a middleman, so we got rid of him. You set up ticket sales for your party or event, people buy tickets, receive them via email, and you scan them at the door. Sorted. You can sell products: If you want to keep it real and sell actual items, that's great! But, you can also go full digital (woah) and sell e-books, online courses, whatever you please. Will this work on a smartphone? Absolutely! Spaza is 100% mobile responsive. How will people purchase my products or tickets? 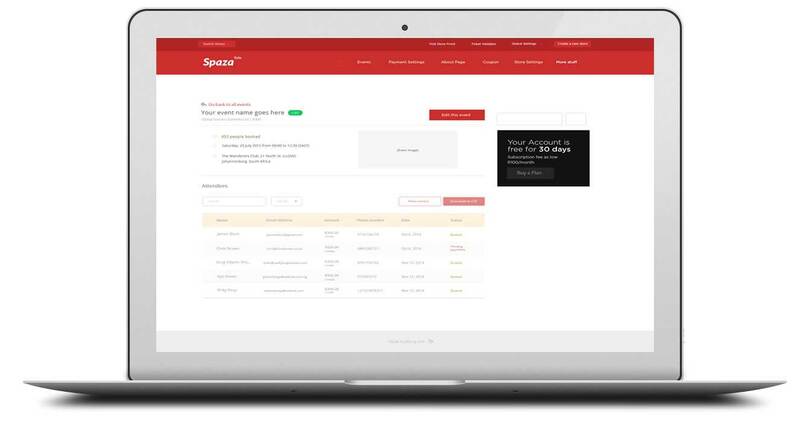 Spaza has four payment options: EFT, PayFast, PayGate and PayPal. You can sell to anyone in the world who has money. All purchases and monetary exchanges are controlled by the above third-party systems, which encrypt personal information. It's all very safe.